Foraged in just about every zone. Obviously this was not as good of a spot as I had hoped for. Foraged Fruit in Clan Runnyeye 1st try. Foraged Fruit today in Misty Thicket. I recently brought a wood-elf ranger to life; (read that they make the best foragers of all)! Began in Gloomingdeep Mines(don't we all?) & decided to try my forage skill while there. 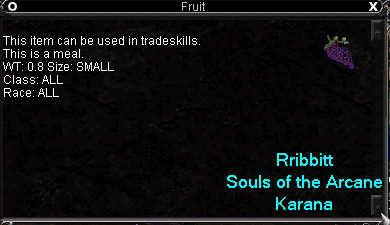 At level 2, I got "Fruit"!!!! Abysmal Sea is good, only a few foraged items, fruit, vegetables, and roots so far. So if you want fruit, is a decent spot, and completely safe for any level. went to LOC in misty ( the spawn had berries NOT fruit ). so dont go to Misty if ya after Fruit. I went to the above posters suggested loc and i found the bags , but they were berries, not fruit . I read on EQ Traders about this spot located at p855 n1512 in Misty Thicket and its true, 3 spawn every 5 min. look for bags, location is center of all 3 spawns and is a low depression. Just spent some time in Misty. There is no such loc p855 n1512. In fact, the edge of the map in the upper right corner (near halfling skelly, diseased rat, halfling zombie camp) is around p854 n1434...that's not in a low depression, it's up the hill as far as i can go at the edge of the map. Thanks for posting this b.s. Prior to changes, that was the correct spot. Need to find the most current spot, which I am about to do on a low level toon. Will edit when I find it. Update: the spot is at pos 679, neg 640 (for one of them at least). It is not fruit, but berries--be advised. ANOTHER BERRY SPAWN AT ABOUT POS 603, NEG 593. Third spawn is at Pos 610, Neg 661. A nice little triangle to work! Why did the Greater Skeleton Cross The Road? Not normally for sale unless someone has sold them to a vendor. They are a foraged item. May try looking in the Bazaar. Or hit up your friendly neighborhood Ranger. What about PoK, GFAY, LFAY, etc. ?